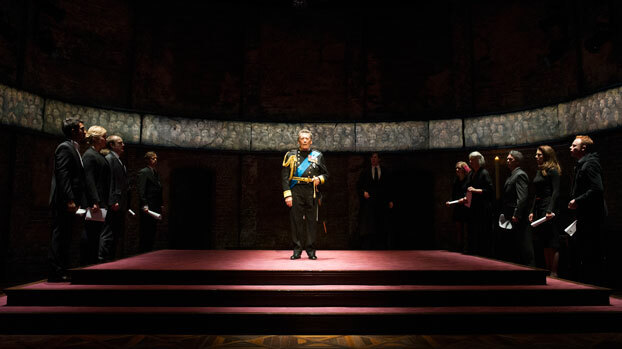 The idea for King Charles III arrived in my imagination with the form and content very clear, and inextricably linked. It would be a play about the moment Charles takes the throne, and how his conscience would lead him to refuse to sign a bill into law. An epic royal family drama, dealing with power and national constitution, was the content, and therefore the form had surely to be Shakespearean. It would need five acts, quite possibly a comic subplot, but most worryingly, the majority of it would have to be in verse. This was terrifying. Verse is one thing (and a thing I knew very little about), but verse drama? And a form of verse drama that would lay this play alongside the greatest literature in the English language? All of this was enough to stop me writing a word, so for two years the play remained merely a good idea – unspoiled by any attempt to write it into reality. Eventually I mentioned it to the director Rupert Goold, who commissioned it straight away, and then pestered me into confronting it. When I finally started, I had two ways in, to make it approachable. Firstly, although I knew little about verse, I did know something of Shakespeare. At university, I studied English and theatre, and one of our lecturers, Bridget Escolme, had been doing a PhD on Shakespearean staging traditions. We'd learned about the length of time it took to make an entrance on to the stage, the conventions of crowd scenes, up and down, heaven and hell – the mechanics of the stage traffic. Crucially, we learned that this could all be seen, reflected in, and at times indicated by, the verse. 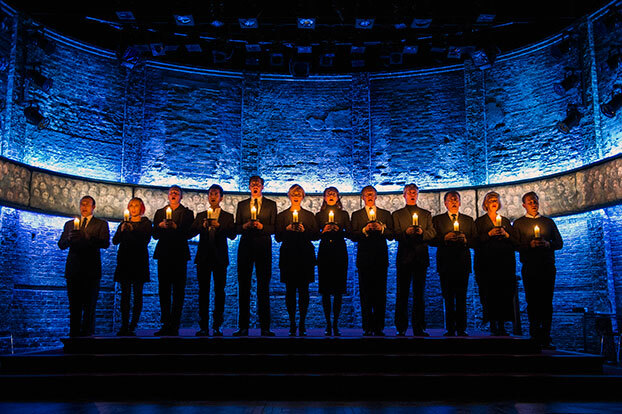 There are few stage directions in Shakespeare because the verse serves that purpose. The dramatic action of the lines is related to the physical action required. And the audience is co-opted, part of the drama: it can become a crowd, a mob, the entire English population, or, during a soliloquy, the brain of the character. So I understood that Shakespeare's verse was never concerned with any pure authorial voice, but was instead a vast multiplicity of viewpoints, a rough and tumble performance text. Secondly, I'd seen Ken Campbell perform at the Edinburgh fringe one year. He stepped forward and boldly claimed he knew exactly how Shakespeare wrote his plays. He had solved the authorship debate. Then his group entered and began to improvise in iambic pentameter, surprisingly well. Perhaps it lacked the finesse and poetry of Shakespeare – but actually, perhaps it didn't. Despite being made up in the moment, it was moving, funny, meaningful and dramatic. Campbell claimed that the reason Shakespeare could write the verse so well, and be so prolific, was that as an actor, he had to hold about 20 parts from different plays in his head at any one time. The iambic rhythm had been drummed into him until it became instinctual. The language was, to him, a vernacular. He had done his 10,000 hours of practice. So clearly, I was more than a little behind Shakespeare. I needed to practise. I wrote lines and lines of iambic pentameter, speaking it round the house to myself, trying to get to the point where I might be able to improvise the verse fluidly, hoping that if I could, the writing would be driven by the desires and thoughts of the characters, rather than aesthetics or metric requirements. I wrote test speeches and scenes for the play, trying to see if or how it might work. And doing all this, I learned a few things – that the temptation was immediately to get carried away with metaphor and simile. Characters in this form are allowed to use extended imagery to explore psychology and for a writer this is seductive. You can understand why Shakespeare succumbed to it so often. And, to an extent, audiences also enjoy it, but it has to relate to the specific predicament the character is in, in that moment, and it can't go on too long. The audience is only, in the end, concerned with the drama – anything that veers too far away from it, however well written, will lose their interest. The graveyard of the cursed internet. Although a part of this speech remains in the play, most of it was removed, because it occurs too early. We haven't built to this level of passion. But not only that. It feels too emotive and if spoken on stage, would make the prime minister seem unhinged. It became clear this language – with "remnants", "destroyed", "tombs", "scrawled" and "graveyard" – was simply too much. The vocabulary the characters used, and their verse, even though heightened, couldn't stray too far from the language we would believe them to speak day to day. These are not fairytale characters: we want to believe in them as the real people we know exist. If King approves it can through boredom work. We make no fuss 'cept that I have moved, got job. Unearned and with a target on my back. I wrote this speech quite fluidly within the scene, but found, because Harry is passionate, he manages to tell the story of what he wants to happen, but also explain the reason for it, all within seven lines. I suspect if I wrote this in a naturalistic play, the speech would be significantly longer. It reminds me of what Peter O'Toole said about speaking Shakespeare – that while the convention is to match the thought with the word, he found it works much better when the thought is just behind the word. The language leads, and we only have time to think in its wake. I only manage it a few times in the play, but in performance you can sometimes feel the audience enjoying the experience of catching up. Having done my tests, and feeling a little more confident, I planned the play, again and again. There was indeed a subplot, of Harry falling in love with a commoner art student. Diana's ghost would make an appearance. But the planning was mainly to make sure the plot significantly moved forward in every scene, and did so through knotty problems that posed deep familial and constitutional problems. This meant that when I came to write the scenes there would be a lot for the characters to achieve through verse – not just explain their position, or psychology, but they would use the language as rhetoric to get what they want. Finally then, having settled on a plan, I began to write, and ended up pretty much going from beginning to end. With other plays I've written very fast: I'm keen for the energy of the moment to translate on to the page, so characters say things that surprise me. 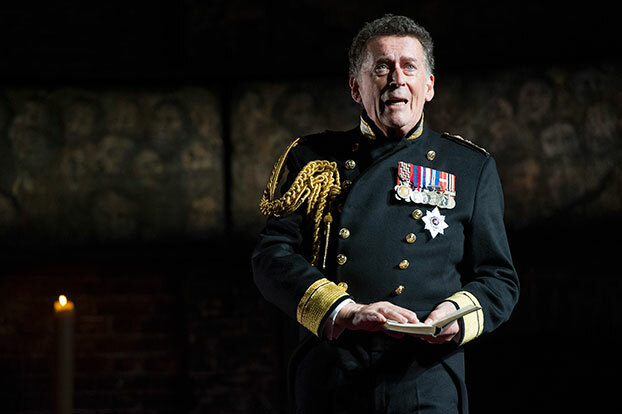 But with Charles III, the verse slowed me down. And I found I loved it. The writing became more considered, rather than impulsive. To paraphrase Charles in the play, it felt "slow cooked" rather than "microwaved", and so as the play emerged I felt it was something very different from anything I'd written before. The other thing that surprised me as the play grew was that it was defiantly unironic. I found the verse rejected irony, forcing me to take the characters seriously. Another moment that didn't make the final draft (but lasted until the first preview, mainly at my insistence) was spoken by Charles, just after he sees the ghost. A fraud. Simplicity! And badly done! I wanted to see this played in front of an audience, because I was sure this knowing wink was in the Shakespearean mode, and would work well. Sure enough, it got a big laugh, but simultaneously it destroyed the scene. These lines told the audience not to take Charles, or the play, seriously, and that was the opposite of the message we needed. This was the case throughout – the terms the verse and the play worked on were sincere and meaningful. It wasn't a postmodern take on Shakespeare, it wasn't a parody or a pastiche – it was a play, telling a story the audience should care about. Anything that worked against this was swiftly cut. That currently does tear our country up. That currently does tear at our country. In the first, the emphasis falls on "up", whereas by breaking with the metre in the second version it falls on "tear" and "country". Vastly better. Once we were in rehearsal there were many more examples of this. A company of actors and a good director became the best editor one could imagine. The play lost about 20 minutes in running time, and was far better for it. Then in performance audiences seemed to enjoy it. Some of them didn't realise it was in verse until they saw the text on the page. At first I thought this was a shame, but I quickly understood that it meant they were enjoying it for all the right reasons – meaning, imagery, character – rather than worrying about the technical aspects. Surely this is true in every element of theatre. The audience wants the lighting to enhance the mood and atmosphere of the scene – not to wonder how the lanterns are attached or wired. The mechanics of verse drama should happen behind the scenes, allowing the audience to experience the characters and story. And now, despite saying how this form was uniquely connected to the content, and I can't imagine ever writing another play in verse, I'm not so sure. I hugely enjoyed the process of writing this play, more than any play I'd written before. I loved what heightened language could do in a scene, and being able to have a character explore inner decision-making and psychology with an audience. I'd be sad never to have access to all these modes again. So I reserve the right to return to verse drama one day. Even iambic pentameter. King William V?